Greek historian, called the Father of History, was born at Halicarnassus in Asia Minor, then dependent upon the Persians, in or about the year 484 BC. Herodotus was thus born a Persian subject, and such he continued until he was 30 or 35 years of age. At the time of his birth Halicarnassus was under the rule of a queen Artemisia. The year of her death is unknown; but she left her crown to her son Pisindelis (born about 498 BC), who was succeeded upon the throne by his son Lygdamis about the time that Herodotus grew to manhood. The family of Herodotus belonged to the upper rank of the citizens. His father was named Lyxes, and his mother Rhaeo, or Dryo. He had a brother Theodore, and an uncle or cousin Panyasis, the epic poet, a personage of so much importance that the tyrant Lygdamis, suspecting him of treasonable projects, put him to death. It is probable that Herodotus shared his relative's political opinions, and either was exiled from Halicarnassus or departed it voluntarily at the time of his execution. Of the education of Herodotus no more can be said than that it was thoroughly Greek, and embraced no doubt the three subjects essential to a Greek liberal education -- grammar, gymnastic training and music. His studies would be regarded as completed when he attained the age of eighteen, and took rank among the ephebi or eirenes of his native city. In a free Greek state he would at once have begun his duties as a citizen, and found therein sufficient employment for his growing energies. But in a city ruled by a tyrant this outlet was wanting; no political life worthy of the name existed. 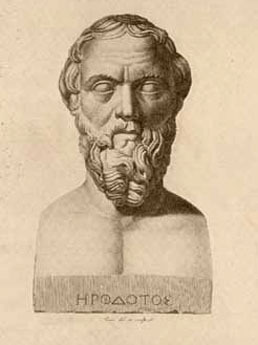 Herodotus may thus have had his thoughts turned to literature as furnishing a not unsatisfactory career, and may well have been encouraged in his choice by the example of Panyasis, who had already gained a reputation by his writings when Herodotus was still an infant. At any rate it is clear from the extant work of Herodotus that he must have devoted himself early to the literary life, and commenced that extensive course of reading which renders him one of the most instructive as well as one of the most charming of ancient writers. The poetical literature of Greece was already large; the prose literature was more extensive than is generally supposed; yet Herodotus shows an intimate acquaintance with the whole of it. The Iliad and the Odyssey are as familiar to him as Shakespeare to the educated Englishman. He is acquainted with the poems of the epic cycle, the Cypria, the Epigoni, etc. He quotes or otherwise shows familiarity with the writings of Hesiod, Olen, Musaeus, Bacis, Lysistratus, Archilochus of Paros, Alcaeus, Sappho, Solon, Aesop, Aristeas of Proconnesus, Simonides of Ceos, Phrynichus, Aeschylus and Pindar. He quotes and criticizes Hecataeus, the best of the prose writers who had preceded him, and makes numerous allusions to other authors of the same class. It must not, however, be supposed that he was at any time a mere student. It is probable that from an early age his inquiring disposition led him to engage in travels, both in Greece and in foreign countries. He traversed Asia Minor and European Greece probably more than once; he visited all the most important islands of the Archipelago -- Rhodes, Cyprus, Delos, Paros, Thasos, Samothrace, Crete, Samos, Cythera and Aegina. He undertook the long and perilous journey from Sardis to the Persian capital Susa, visited Babylon, Colchis, and the western shores of the Black Sea as far as the estuary of the Dnieper; he travelled in Scythia and in Thrace, visited Zante and Magna Graecia, explored the antiquities of Tyre, coasted along the shores of Palestine, saw Gaza, and made a long stay in Egypt. At the most moderate estimate, his travels covered a space of thirty-one degrees of longitude, or 1700 miles, and twenty-four of latitude, or nearly the same distance. At all the more interesting sites he took up his abode for a time; he examined, he inquired, he made measurements, he accumulated materials. Having in his mind the scheme of his great work, he gave ample time to the elaboration of all its parts,and took care to obtain by personal observation a full knowledge of the various countries. The travels of Herodotus seem to have been chiefly accomplished between his twentieth and his thirty-seventh year (464-447 BC). It was probably in his early manhood that as a Persian subject he visited Susa and Babylon, taking advantage of the Persian system of posts which he describes in his fifth book. His residence in Egypt must, on the other hand, have been subsequent to 460 BC, since he saw the skulls of the Persians slain by Inarus in that year. Skulls are rarely visible on a battlefield for more than two or three seasons after the fight, and we may therefore presume that it was during the reign of Inarus (460-454 BC), when the Athenians had great authority in Egypt, that he visited the country, making himself known as a learned Greek, and therefore receiving favor and attention on the part of the Egyptians, who were so much beholden to his countrymen. On his return from Egypt, as he proceeded along the Syrian shore, he seems to have landed at Tyre, and from there to have gone to Thasos. His Scythian travels are thought to have taken place prior to 450 BC. It is a question of some interest from what center or centers these various expeditions were made. Up to the time of the execution of Panyasis, which is placed by chronologists in or about the year 457 BC, there is every reason to believe that Herodotus lived at Halicarnassus. His travels in Asia Minor, in European Greece, and among the islands of the Aegean, probably belong to this period, as also his journey to Susa and Babylon. We are told that when he departed Halicarnassus on account of the tyranny of Lygdamis, in or about the year 457 BC, he took up his abode in Samos. That island was an important member of the Athenian confederacy, and in making it his home Herodotus would have put himself under the protection of Athens. The fact that Egypt was then largely under Athenian influence may have induced him to proceed, in 457 or 456 BC, to that country. The stories that he had heard in Egypt of Sesostris may then have stimulated him to make voyages from Samos to Colchis, Scythia and Thrace. He was thus acquainted with almost all the regions which were to be the scene of his projected history. After Herodotus had resided for some seven or eight years in Samos, events occurred in his native city which induced him to return. The tyranny of Lygdamis had gone from bad to worse, and at last he was expelled. According to Su�das, Herodotus was himself an actor, and indeed the chief actor, in the rebellion against him; but no other author confirms this statement, which is intrinsically improbable. It is certain, however, that Halicarnassus became henceforward a voluntary member of the Athenian confederacy. Herodotus would now naturally return to his native city, and enter upon the enjoyment of those rights of free citizenship on which every Greek set a high value. He would also, if he had by this time composed his history, or any considerable portion of it, begin to make it known by recitation among his friends. There is reason to believe that these first attempts were not received with much favor, and that it was in chagrin at his failure that he precipitately withdrew from his native town, and sought a refuge in Greece proper (about 447 BC.). We learn that Athens was the place to which he went, and that he appealed from the verdict of his countrymen to Athenian taste and judgment. His work won such approval that in the year 445 BC, on the proposition of a certain Anytus, he was voted a sum of ten talents (quite a large amount of money) by decree of the people. At one of the recitations, it was said, the future historian Thucydides was present with his father, Olorus, and was so moved that he burst into tears, whereupon Herodotus remarked to the father -- "Olorus, your son has a natural enthusiasm for letters." Athens was at this time the center of intellectual life, and could boast an almost unique galaxy of talent -- Pericles, Thucydides the son of Melesias, Aspasia, Antiphon, the musician Damon, Phidias, Protagoras, Zeno, Cratinus, Crates, Euripides and Sophocles. Accepted into this brilliant society, on familiar terms with all probably, as he certainly was with Olorus, Thucydides and Sophocles, he must have been tempted, like many another foreigner, to make Athens his permanent home. It is to his credit that he did not yield to this temptation. At Athens he must have been a dilettante, an idler, without political rights or duties. As such he would have soon ceased to be respected in a society where literature was not recognized as a separate profession, where a Socrates served in the infantry, a Sophocles commanded fleets, a Thucydides was general of an army, and an Antiphon was for a time at the head of the state. Men were not men according to Greek notions unless they were citizens; and Herodotus, aware of this, probably sharing in the feeling, was anxious, having lost his political status at Halicarnassus, to obtain such status elsewhere. At Athens the franchise, jealously guarded at this period, was not to be attained without great expense and difficulty. Accordingly, in the spring of the following year he sailed from Athens with the colonists who went out to found the colony of Thurii, and became a citizen of the new town. From this point of his career, when he had reached the age of forty, we lose sight of him almost wholly. He seems to have made but few journeys, one to Crotona, one to Metapontum, and one to Athens (about 430 BC) being all that his work indicates. No doubt he was employed mainly, as Pliny testifies, in retouching and elaborating his general history. He may also have composed at Thurii that special work on the history of Assyria to which he twice refers in his first book, and which is quoted by Aristotle. It has been supposed by many that he lived to a great age, and argued that "the never-to-be-mistaken fundamental tone of his performance is the quiet talkativeness of a highly cultivated, tolerant, intelligent, old man" (Dahlmann). But the indications derived from the later touches added to his work, which form the sole evidence on the subject, would rather lead to the conclusion that his life was not very prolonged. There is nothing in the nine books which may not have been written as early as 430 BC; there is no touch which, even probably, points to a later date than 424 BC. As the author was evidently engaged in polishing his work to the last, and even promises touches which he does not give, we may assume that he did not much outlive the date last mentioned, or in other words, that he died at about the age of sixty. The predominant voice of antiquity tells us that he died at Thurii, where his tomb was shown in later ages. The History. In estimating the great work of Herodotus, and his genius as its author, it is above all things necessary to conceive aright what that work was intended to be. It has been called "a universal history", "a history of the wars between the Greeks and the barbarians", and "a history of the struggle between Greece and Persia." But these titles are all of them too comprehensive. Herodotus, who omits wholly the histories of Phoenicia, Carthage and Etruria, three of the most important among the states existing in his day, cannot have intended to compose a "universal history", the very idea of which belongs to a later age. He speaks in places as if his object was to record the wars between the Greeks and the barbarians; but as he omits the Trojan war, in which he fully believes, the expedition of the Teucrians and Mysians against Thrace and Thessaly, the wars connected with the Ionian colonization of Asia Minor and others, it is evident that he does not really aim at embracing in his narrative all the wars between Greeks and barbarians with which he was acquainted. Nor does it even seem to have been his object to give an account of the entire struggle between Greece and Persia. That struggle was not terminated by the battle of Mycale and the capture of Sestos in 479 BC. It continued for thirty years longer, to the peace of Callias. The fact that Herodotus ends his history where he does shows distinctly that his intention was, not to give an account of the entire long contest between the two countries, but to write the history of a particular war -- the great Persian war of invasion. His aim was as definite as that of Thucydides, or Schiller, or Napier or any other writer who has made his subject a particular war; only he determined to treat it in a certain way. Every partial history requires an "introduction"; Herodotus, untrammelled by examples, resolved to give his history a magnificent introduction. Thucydides is content with a single introductory book, forming little more than one-eighth of his work; Herodotus has six such books, forming two-thirds of the entire composition. By this arrangement he is enabled to treat his subject in the grand way, which is so characteristic of him. Making it his main object in his introduction to set before his readers the previous history of the two nations who were the actors in the great war, he is able in tracing their history to bring into his narrative some account of almost all the nations of the known world, and has room to expatiate freely upon their geography, antiquities, manners and customs and the like, thus giving his work a "universal" character, and securing for it, without trenching upon unity, that variety, richness and fulness which are a principal charm of the best histories, and of none more than his. In tracing the growth of Persia from a petty subject kingdom to a vast dominant empire, he has occasion to set out the histories of Lydia, Media, Assyria, Babylon, Egypt, Scythia, Thrace, and to describe the countries and the peoples inhabiting them, their natural productions, climate, geographical position, monuments, etc. ; while, in noting the contemporaneous changes in Greece, he is led to tell of the various migrations of the Greek race, their colonies, commerce, progress in the arts, revolutions, internal struggles, wars with one another, legislation, religious tenets and the like. The greatest variety of episodical matter is thus introduced; but the propriety of the occasion and the mode of introduction are such that no complaint can be made; the episodes never entangle, encumber or even unpleasantly interrupt the main narrative. It has been questioned, both in ancient and in modern times, whether the history of Herodotus possesses the essential requisite of trustworthiness. Several ancient writers accuse him of intentional untruthfulness. Moderns generally acquit him of this charge; but his severer critics still urge that, from the inherent defects of his character, his credulity, his love of effect and his loose and inaccurate habits of thought, he was unfitted for the historian's office, and has produced a work of but small historical value. Perhaps it may be sufficient to remark that the defects in question certainly exist, and detract to some extent from the authority of the work, more especially of those parts of it which deal with remoter periods, and were taken by Herodotus on trust from his informants, but that they only slightly affect the portions which treat of later times and form the special subject of his history. In confirmation of this view, it may be noted that the authority of Herodotus for the circumstances of the great Persian war, and for all local and other details which come under his immediate notice, is accepted by even the most skeptical of modern historians, and forms the basis of their narratives. Among the merits of Herodotus as an historian, the most prominent are the diligence with which he collected his materials, the candor and impartiality with which he has placed his facts before the reader, the absence of party bias and undue national vanity, and the breadth of his conception of the historian's office. On the other hand, he has no claim to rank as a critical historian; he has no conception of the philosophy of history, no insight into the real causes that underlie political changes, no power of penetrating below the surface, or even of grasping the real interconnection of the events which he describes. He belongs distinctly to the romantic school; his forte is vivid and picturesque description, the lively presentation of scenes and actions, characters and states of society, not the subtle analysis of motives, the power of detecting the undercurrents or the generalizing faculty. But it is as a writer that the merits of Herodotus are most conspicuous. "0 that I were in a condition", says Lucian, "to resemble Herodotus, if only in some measure! I by no means say in all his gifts, but only in some single point; as, for instance, the beauty of his language, or its harmony, or the natural and peculiar grace of the Ionic dialect, or his fullness of thought, or by whatever name those thousand beauties are called which to the despair of his imitator are united in him." Cicero calls his style "copious and polished", Quintilian, "sweet, pure and flowing"; Longinus says he was "the most Homeric of historians"; Dionysius, his countryman, prefers him to Thucydides, and regards him as combining in an extraordinary degree the excellences of sublimity, beauty and the true historical method of composition. Modern writers are almost equally complimentary. "The style of Herodotus", says one, "is universally allowed to be remarkable for its harmony and sweetness." "The charm of his style", argues another, "has so dazzled men as to make them blind to his defects." Various attempts have been made to analyze the charm which is so universally felt; but it may be doubted whether any of them are very successful. All, however, seem to agree that among the qualities for which the style of Herodotus is to be admired are simplicity, freshness, naturalness and harmony of rhythm. Master of a form of language peculiarly sweet and euphonical, and possessed of a delicate ear which instinctively suggested the most musical arrangement possible, he gives his sentences, without art or effort, the most agreeable flow, is never abrupt, never too diffuse, much less prolix or wearisome, and being himself simple, fresh, na�ve (if we may use the word), honest and somewhat quaint, he delights us by combining with this melody of sound simple, clear and fresh thoughts, perspicuously expressed, often accompanied by happy turns of phrase, and always manifestly the spontaneous growth of his own fresh and unsophisticated mind. Reminding us in some respects of the quaint medieval writers, Froissart and Philippe de Comines, he greatly excels them, at once in the beauty of his language and the art with which he has combined his heterogeneous materials into a single perfect harmonious whole.